Are you leaving your business’s data at risk, right now? Smartphones can connect to almost every part of your network, every file and email, dashboards, apps, and all of the proprietary information you have on your network. And, these devices seem to become obsolete every year or so, with customers and staff always demanding the latest and greatest. Transferring all of the data to those devices and then removing it from these phones are both monumental tasks. A simple reformatting, resetting, or push back to factory settings doesn’t completely erase your smartphone’s hard drive. You need to shred these devices to properly protect your network. And, if you’re wondering why, here are a few things to keep in mind. The big news here is that manufacturer software doesn’t always wipe Flash storage. It’s incredibly hard and even the top tools tend to fail some of the times. The only thing to guarantee success is to shred that cell phone. One of the biggest mistakes we see is that people think removing the SIM card from your device will wipe away all of the information from a device. Unfortunately, even for phones where you can access and remove the SIM card, internal components you can’t remove will store a variety of information. Recent political scandals and football scandals have prominently featured phones that were destroyed, with reports saying the owner or a staff member took a hammer to the device. That destruction of physical elements doesn’t always mean a true destruction of data. Eric Brown, a lab manager at the forensic data-recovery firm Flashback Data, says that this type of physical attack may not actually harm the memory chips and other components that need to be destroyed. 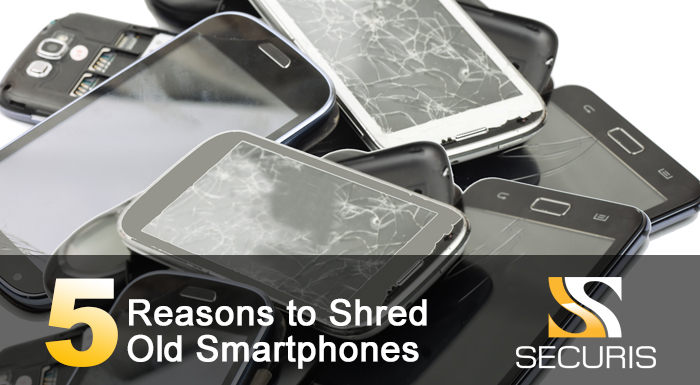 His company recommends shredding because it prevents the ability for undamaged components to be put in a new phone and have their data accessed. Use the right tool for the right job, and that means a thorough shredder. Today’s thieves only need a little bit of information to harm your company. All it takes is access to an email address or a system dashboard to start getting to the heart of your data, whether that’s customer credit cards, bank accounts, contact information, HR documents, and other personal information. In a world where everything is connected, we’ve got a lot more points of vulnerability. And that vulnerability is for you and your team. Social networks, personal emails to family, photos of children and so much more are going to be on these devices, even if they’re supposed to be used only for work. Why take the risk that this could fall into the wrong hands? Why risk that liability of loss? That’s why we at Securis always recommend collecting smartphones and cell phones from your employees when changing devices, and then shredding them to avoid these risks and exposures.